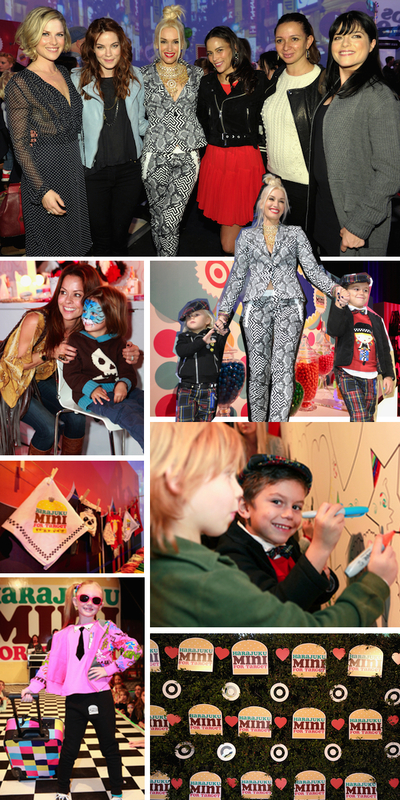 This week, Gwen Stefani’s much-anticipated spunky kids’ collection – Harajuku Mini for Target – hit stores. We showed you the first sneak peek at the collection and now we have an interview with the celeb mom. The No Doubt singer spent Saturday in Los Angeles celebrating at a launch party in honor of the new line. Fellow celeb moms, dads and their tots hung out with Gwen’s sons Kingston and Zuma as they hit up the ice cream bar, personalized Harajuku Mini shirts at the workstation and drew on the coloring book wall. That will probably be the last time moms in attendance like Maya Rudolph, Selma Blair, Ali Larter, Paula Patton, Brooke Burke and Soleil Moon Frye let their little ones run rampant with markers. Before the fun day came to a close, mini models sashayed Harajaku Mini for Target threads down the runway in an adorable fashion show.